Colin Kaepernick #7 of the San Francisco 49ers looks on from the sidelines during the second half against the Atlanta Falcons at the Georgia Dome on December 18, 2016 in Atlanta, Georgia. As the NFL continues to defend itself in an ongoing collusion grievance filed by Colin Kaepernick, its official apparel partner unveiled a new advertisement featuring the former San Francisco 49ers quarterback himself. Kaepernick remains a free agent after last playing in the NFL in 2016. 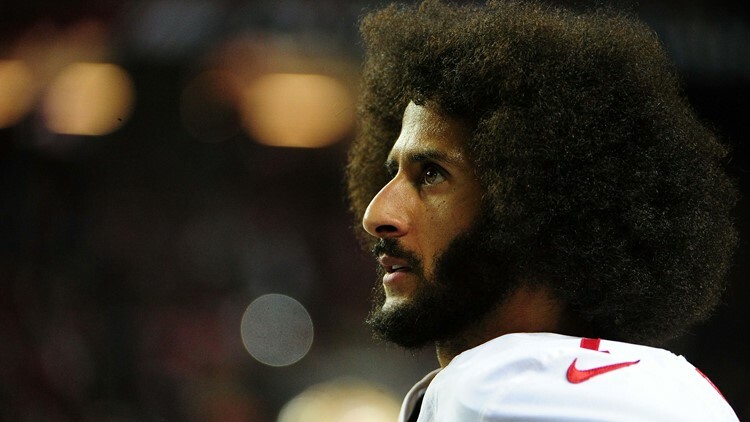 He and his lawyers contend that NFL owners have purposefully denied the former quarterback employment in the league due to his protests of police brutality and social inequality during the pre-game playing of the national anthem. Kaepernick first sat and then kneeled during the anthem in the 2016 preseason, and continued his protest through the rest of the season. Other players followed his lead, as several began to protest last year and helped create a number of programs. Kaepernick will be one of the faces of Nike’s 30th anniversary of the “Just Do It” campaign. "We wanted to energize its meaning and introduce 'Just Do It' to a new generation of athletes," Fisanotti said. Nike is the NFL’s official apparel sponsor and manufactures the jerseys and game day apparel worn by all 32 franchises. Nike signed Kaepernick in 2011 to endorse its products. Kaepernick recently won a summary judgment in his collusion case, in which arbitrator Stephen Burbank felt there was enough evidence for the case to go to trial.